It would be less than truthful if I told you that I am not extremely particular when it comes to handbags. There are a few elements that I never really cared for, such as the shape of a bowling bag or a doctor's bag. Another handbag characteristic that is not my favorite is having a coin pouch or a phone case dangling on the outside. Well, who would have thought that one handbag could change my mind about both these things? The Gemma Bowler Bag by Nicole Lee U.S.A. has done just that. For some reason, the shape of this bowler just works for me. Instead of looking stiff and overly structured, the faux leather looks soft and appears to drape like a supple leather would. The slant pocket in the front not only keeps the detachable coin purse from dangling about, but it turns the coin purse into part of the handbag design. I also love the details of the hardware, from the zipper trimmed bow on the coin purse to the framed buckles on the front of the bag. This bag measures 10.5" L x 10" H x 6.75" W and comes in Camel, Pale Green, and Skin (shown). Since I like to carry my rolled handle bags like satchels, I would likely not use the adjustable detachable shoulder strap, which measures 25" to 51". 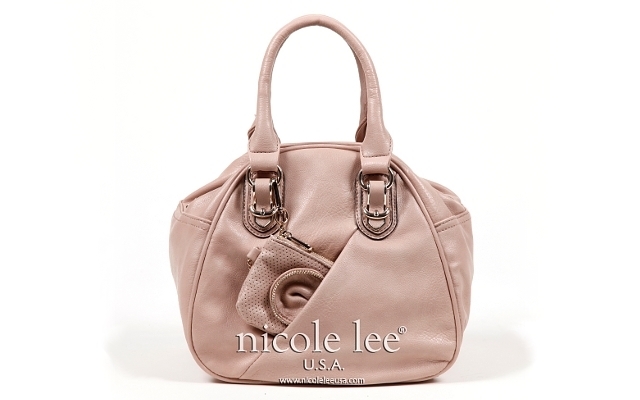 Visit NicoleLeeOnline.com for the full product description. The Gemma Bowler retails for $86.